Lower Princess Street was once labeled “Little Jerusalem” and “Second-Hand Row,” but there were Jewish shops to be found on nearby Ontario Street as well. 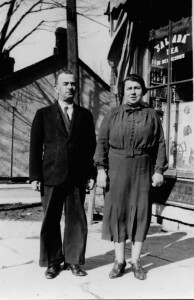 At 240-242 Ontario, in the part of the Gilad Parking Lot adjacent to what is now the Aroma Restaurant, stood Sugarman’s Second Hand Store in the 1920s. Harry and Leah Sugarman, with their son Abe, came to Kingston at the turn of the twentieth century at the recommendation of Harry’s uncle, Louis Langbort. Louis Langbort was the first Jewish merchant to hang out a shingle on lower Princess in the year 1895. According to Beth Israel’s official history, he and his wife Annie eventually became successful hoteliers on Ontario Street. It also mentions that the Langborts’ farm (location unknown) was a popular summer retreat for generations of relatives, including the Palmers (see Modern Furniture) and Sugarmans, among others. 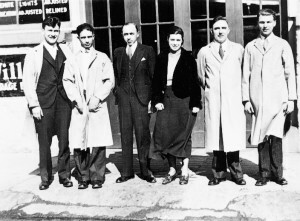 During the 1930s and 1940s, Harry Sugarman’s son, Moe, ran a concern called the Frontenac Auto Electric Service. It was located less than a block away, on the corner of Brock and Ontario, at the eastern-most corner of what is now the Gilad Parking Lot.